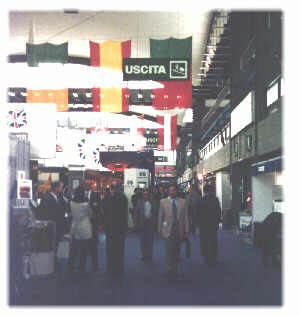 The First Seatrade Mediterranean Cruise & Ferry Convention held in Genoa (17 - 20 September 1996) has gone over the most optimistic expectations. In excess of 350 exhibitors from 18 countries and more than five thousands visitors have determined the full success of the event which is already scheduled for next four editions. During the four days many interesting debates among top level experts of the industry have occurred. Fabio Capocaccia from Genoa Port Authority (see picture of the Cruise Terminal) introduced the conference as president of the Organizing Committee. 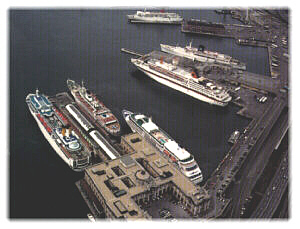 "Genoa is the most appropriate venue of this if one considers the dramatic growth of cruise traffic here. Since 1991 the number of passengers has trebled. The same pace of growth has been recorded, more or less, all over the Mediterranean ports". In the first session an international panel has made the point on the cruise market situation. Nicola Costa (president of Costa Crociere) has expressed faith in further development of the market. "In a period of stagnation, travel and leisure are the last expenses to be cut by the individuals. Therefore in my opinion the European market, even though at more tranquil pace, can follow the trend experienced in these last years". Corrado Antonini, Chairman of Fincantieri Shipyards, has pointed out that the race towards gigantism is a nearly irreversible tendency. "We are ready to the challenge, as well shown by the dramatic growth of our portfolio since we decided to come back to the passenger industry at the end of the Eighties". Fincantieri currently shares 40 per cent of the newbuildings on order in the world. Pam Conover (Carnival Co.) has highlighted the need for globalization. "The future is for global markets. People are becoming more international in their tastes." Finally Aldo Grimaldi (Grandi Navi Veloci and Grimaldi Cruises) has explained why ferries and cruisers are becoming more and ore similar. "Nowadays a ferry crossing is no more a compulsory transit to reach a holiday resort but has become a part of the vacation as well. This philosophy has inspired us in the construction of three cruise-ferries in the last four years. These vessels are able of 23 knots and passengers are offered any type of leisure and entertainment on board". Last May "Fantastic" (the third) was delivered to Grimaldi Group and her sister "Excellent" is due for 1998.